Having a dog that won't sleep at night can be a frustrating situation for both you and the dog. Instead of the both of you losing sleep, the best course of action is to determine the cause of your dog's sleep issues. There are a number of reasons why a dog can have trouble sleeping through the night. Some dogs, particularly younger dogs, or high energy and working breeds, have trouble going to sleep at night because they don't receive enough exercise. A healthy dog should get at least thirty minutes to up two hours of exercise each day. Running around in your backyard unsupervised is not enough! If you find your dog is extremely active and won't settle, and your veterinarian has ruled out medical issues, try increasing his exercise to two sessions: one in the morning and one in the evening. Your dog should feel tired and will settle in for the night once he expends his energy. If increasing your dog's daily walks is difficult due to inclement weather, try beefing up his exercise at home by engaging him in some games such as hide and seek, fetch (if you have enough room to toss a ball) or tug. Teaching and practicing general obedience skills and tricks daily is also a great way to tire your dog out, especially if he's confined indoors. Try teaching him one new trick per day or practice obedience behaviors such as "stay." Increase the distance and distractions to make the training more of a mental exercise for him, which can be just as tiring as physical exercise. Make these training sessions short, and spread them throughout the day. If you have a young puppy, he may be unable to sleep through the night because his bladder is too small to hold his urine that long. In general, you can expect your puppy to be able to hold his urine one hour for every month he is old, so a three-month-old puppy can hold his urine for about four hours. This is not a long-term problem as the older the puppy gets, the more he'll be able to make it through the night. In the meantime, try crate training your puppy and take his water dish away approximately two hours before you go to sleep. Make sure you take him out to eliminate right before you go to bed. Keep him on a feeding schedule throughout the day, so you have a good idea of when he will need to urinate/defecate. Puppies generally need to go after they eat and after play sessions. While some forms of separation anxiety can be quite severe and require veterinary intervention, it's not unusual for a dog to become upset if separated from his owners at night. A dog that is new to the home and uncertain of his environment, or a dog that feels anxious sleeping outside the bedroom, are examples of mild separation distress. If you keep the dog outside of your bedroom to keep him off the bed, you can put a crate in the bedroom. This will keep your dog off the bed, but also help your dog feel more comfortable because he's closer to you. Place a blanket, old sweater or sweatshirt that smells like you in the crate with him. Your scent should help him feel comfortable. You can also give him something to chew such as a safe bone or food-stuffed toy. Many dogs will work on chewing until they become tired and fall asleep. Some dog owners have experienced success with "wraps" such as the Thundershirt, which helps an animal to calm down with gentle body pressure. If your dog continues displaying anxious behavior at night, consult your veterinarian. She may be able to prescribe anti-anxiety remedy or medication to help him feel calmer. Just like people, dogs can find it hard to sleep if they're feeling physical pain from an injury or a medical issue. 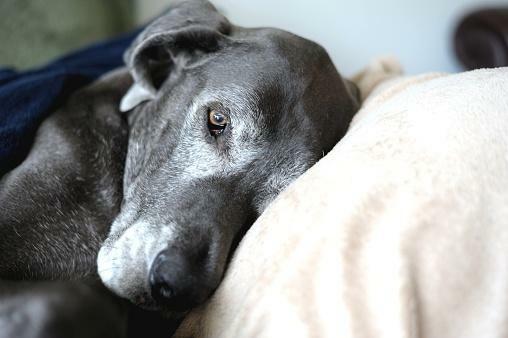 Older dogs who suffer from arthritis can have trouble getting comfortable at night due to painful joint inflammation. Dogs that have fleas can also have trouble sleeping due to their need to keep scratching and general discomfort. Another medical issue that can be painful and cause insomnia is canine cancer. If you suspect your dog is suffering from a medical or parasitic condition, schedule a visit with your veterinarian right away to determine the cause. Make sure you keep your dog comfortable before your veterinary visit. If the dog is experiencing physical pain from arthritis or other joint issues, provide him with a comfortable, well-supported bed to lie on, such as an orthopedic dog bed. Dogs suffering from arthritis also can find some relief with heat therapy by applying warm compresses to their joints. If your dog is experiencing pain due to an illness, try massaging him which can help soothe them. Do not give your dog painkillers made for humans, as many of these are toxic such as aspirin, ibuprofen and naproxen sodium. There are medications made for pain in canines that your veterinarian can prescribe. Keep a close watch on him and look for symptoms that may indicate he needs to see an emergency veterinarian, such as excessive panting and drooling, refusal to eat, extreme lethargy, inability to get up or tendency to collapse. If you believe your dog has fleas, there are prescription medications, as well as natural remedies such as flea shampoos. Baths can help soothe an itchy dog's skin as well. You will need to rid the home of fleas which is done by cleaning all of your bedding and laundry and using an Insect Growth Regulator on your carpet to kill the fleas and their larvae. CCD, also known as Cognitive Dysfunction Syndrome (CDS), is similar to Alzheimer's disease in humans and senior dogs suffering from CCD display symptoms such as confusion, insomnia, a decline in house training skills, and pacing. 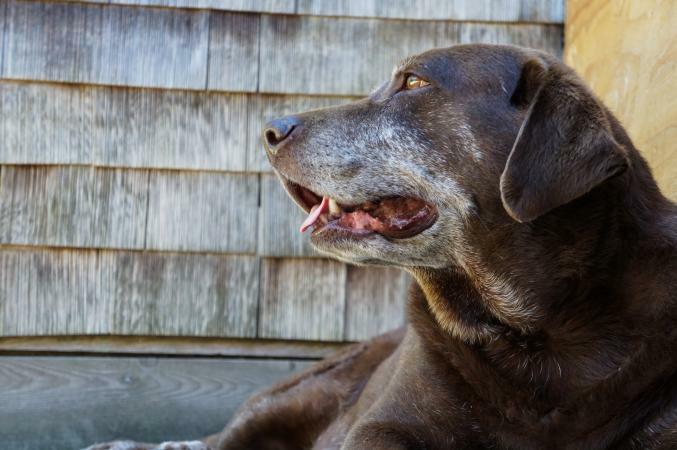 If your aging dog is displaying these symptoms, take him for a full veterinary exam. Unfortunately, there is nothing that can be done to cure the disorder, but depending on the level of severity of your dog's CCD, your veterinarian may prescribe medications such as Anipryl and special veterinary diets and supplements. Your veterinarian may also encourage you to exercise the dog more, both physically and mentally, to help keep his mind active and alert. Increase your dog's exercise but make sure you don't overdo it as older dogs can't move as much as their younger counterparts. Also, try to take him on walks to different places which can be enriching to his mind. If it's an option, one day walk in the woods and another day go to the beach or visit a doggy park. Mental exercise also helps, such as teaching some simple tricks. There are also interactive toys you can purchase which encourage your dog to use his mind to get at food and can be great brain exercise. Sometimes a dog can't sleep at night because something in his environment is disturbing him, causing fear, anxiety or general alertness. If your dog is healthy and has suddenly developed problems with settling at night, and is barking, anxious or seems disturbed, take a good look around your home, both inside and out, to see if your dog is reacting to something. Once you can determine the cause, you can figure out ways either to minimize its impact or to eliminate it. It could be as simple as a neighbor's cat passing by your windows each night, or the scent of a nocturnal animal such as a raccoon nearby. In this case, block your dog's access to areas of the house where he will be able to sense or see outside animals. Also, make sure you keep your outside areas clean of trash and debris that might attract wildlife. Pull down shades on your windows so the dog cannot see a cat passing by. You can also set up a white noise machine to block out noise from the outside. If the animal bothering your dog is a cat with an owner known to you, you can ask them to keep the cat in at night so as not to disturb your dog. Your dog could be reacting to people outside making noise, fireworks, thunderstorms, or other noises and movement. If you can eliminate the noise, that's ideal, although not always possible. If you know fireworks are coming, such as the Fourth of July, take your dog to a quiet spot in the house where he won't be able to hear them and discuss anti-anxiety medication with your veterinarian, so you have it ready to give to him before the fireworks begin. If you can run a fan or a white noise machine and close all your windows and doors firmly to block out the noise, your dog will be less likely to become upset. If your dog has thunderstorm phobia, your veterinarian may need to prescribe anti-anxiety medications to help soothe your dog's fears. You may also try the Thundershirt and music therapy to soothe your pooch if he has mild thunderstorm phobia. If his phobia is severe, you can have your veterinarian or a professional behavior consultant teach you how to use desensitization and classical conditioning to help decrease your dog's fear of thunder. Allowing your dog to stay in an area where there is less static electricity, such as in a bathtub, can also help. If you notice any of these symptoms, your dog may have sleep apnea. This requires an immediate visit to your veterinarian. If your dog is diagnosed with sleep apnea, your bet may prescribe a diet (if the apnea is due to your dog being overweight), give him allergy medication or even suggest surgical intervention. With some observation of your dog's daily routine and help from your veterinarian, you should be able to figure out which of the above scenarios is causing your dog to stay up at night. Following your veterinarian's advice and making some changes in your dog's lifestyle will help the both of you get a good night's sleep.